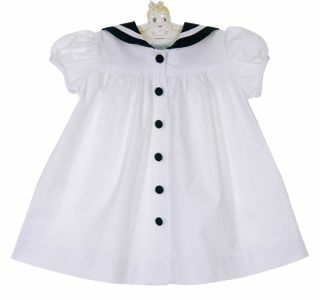 This darling white pure cotton sailor dress is made by Funtasia, a leading manufacturer of classic children's clothing. 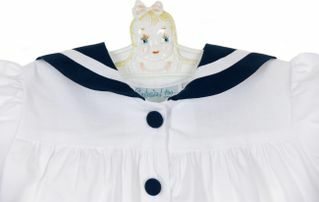 The dress has a gathered skirt falling from a high yoke, short puffed sleeves, and a front buttoned closure. A navy blue sailor collar accented with white trim and navy blue covered buttons complete this sweet dress.